Done in 7 seconds! How to start MT4. 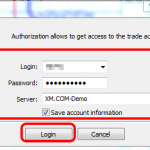 Start MT4 by clicking on the icon XM MT4 desktop.